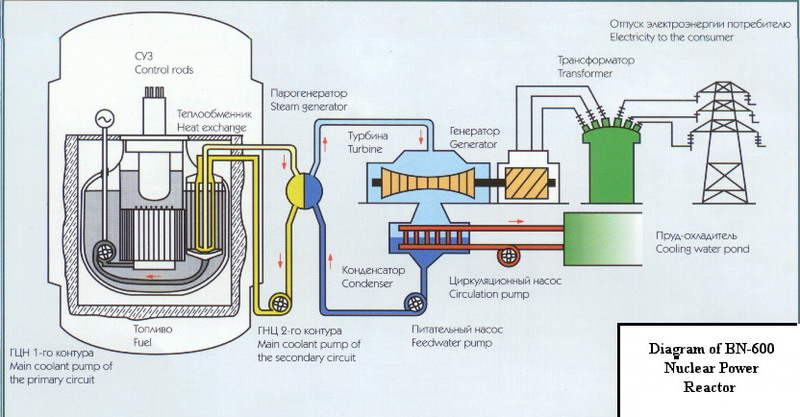 Metal Cooled Reactors usually use liquid sodium or a combination of sodium and potassium. Sometimes these are called breeder, fast, or fast breeder reactors. The United States, France, and Russia have done most of the development in this area. An advantage of this type of reactor is that the liquid metal has great heat transfer properties so that the reactor can be operated at much lower pressures and higher temperatures. Fuel enrichment is very low, if at all. The United States operated, first EBR-1, and then EBR-2, in Idaho for many years. Argonne National Laboratory is the prime contractor for the experimental breeder reactor, EBR-2 project. As some are aware, the commercial breeder reactor program was shutdown in the late 1970's because of nuclear proliferation concerns. On the other hand, France first developed the Phenix reactor and then the Super Phenix. The Russians started with 2, 5, and 10 MW prototypes and subsequently developed BN-350, BN-600, BN-800, and BN-1600 designs. The BN-600 is illustrated by the following figure. The BN-600 is considered a pool-type reactor. Loop designs have intermediate heat exchangers and pumps outside the vessel. Pool designs have almost all equipment located inside the reactor vessel.